I used to go to a church that had a yearly concert/extravaganza called “Celebrate America.” The choir wore red, white, and blue and sang songs about how awesome America is and how God has blessed us and how special we are for it. It was the biggest event of the year, outside our annual Christmas pageant. It made me deeply uncomfortable. My discomfort was rooted in the fact that I don’t believe the United States is any more precious to God that any other nation. Nor do I believe that the U.S. is a particularly Christian nation. Our founders chose to establish a nation of religious freedom for all, not just for Christians, right? 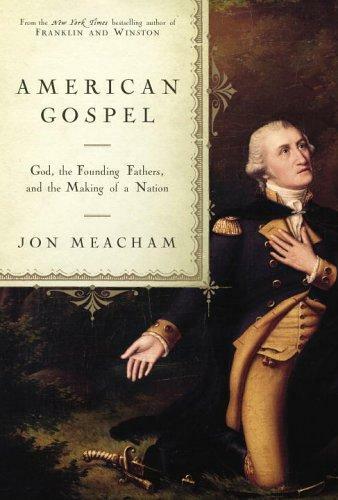 In American Gospel, Jon Meacham looks at U.S. history to learn just what the founders might have intended and to examine how political and religious leaders have interpreted, built on, and contradicted the founders’ intention. The resulting book is a readable survey of religious history in America as well as a call to embrace religious liberty for all. Religion is one of the most pervasive but least understood forces in American life. The point of this book is to explore the role faith has played in the Republic and to illustrate how the Founding Fathers left us with a tradition in which we could talk and think about God and politics without descending into discord and division. It is not a full-scale history of religion in America or of the issue of the separation of church and state. It is, rather, a narrative essay that covers much ground quickly and briefly. Meacham begins with the first Europeans to come to America, pointing out that some came to escape religious persecution and others for economic opportunity. Whatever the reason the colonists came, most early colonial settlements were not bastions of religious liberty. It was only when the colonies came together to create a nation that religious freedom became a priority. Meacham quotes extensively from Washington, Franklin, Jefferson, Madison, and many others to show that they were not necessarily devout Christians and that they deliberately used language referring to “nature’s God” rather than the Christian God. The chapters on the founding contained a lot of information that I’ve heard before. Meacham’s extensive quoting was helpful, but it made for tedious reading when he kept returning to the same key ideas. However, in a day and time when many believe that America was founded as a Christian nation, I understand why Meacham would want to quote as many different voices as possible. The book also includes an appendix of key documents, such as the Virginia Statute for Religious Freedom and Washington’s letter to the Hebrew Congregation at Newport for those who are interested in reading more. The most interesting chapters to me were those that examined how American leaders after the founding understood the intersection of faith and politics. Meacham writes of Lincoln’s desire not that God be on our side but that we be on God’s side and of the ways that abolitionists and slaveholders both used the Bible to defend their point of view. He writes of Theodore Roosevelt’s desire to remove the phrase “In God We Trust” from our money. His reasons, Meacham writes, were “religious, not secular.” Roosevelt felt that it was possibly sacrilegious to use such a phrase on money or on advertisements. Meacham explains how Jerry Falwell went from holding to the traditional Baptist belief that the church should not interfere in politics to becoming a leader of an overtly Christian political movement. I learned a lot and was reminded of a lot that I had forgotten. To argue against a role for faith in politics is essentially futile. The more useful enterprise is to ask, first, what kind of religion — either public or private — is at work in a given situation and, if it is predominantly private, how much of that religious thought or belief ought to shape one’s opinion or votes. The trickier part comes when private religions values involving emotional issues enter the public square — abortion rights, for example, or fetal-stem cell research. One could argue, and the faithful often do, that the Declaration’s guarantee of the rights of life, liberty, and the pursuit of happiness (an element of public religion) extends to such questions. How much weight should politicians and judges give such theological views? In other words, how much religion is too little, just right, or too much in politics and legislating and policy making? The American experience suggests that religious convictions should be a factor but not the dominant one in many such difficult arenas of life and law. When it comes to specific pressing issues, Meacham does not provide answers. What he is clear about is the problem of extreme positions being taken on both sides that leave no room for conversation. I am in full agreement with him here. I’ve become increasingly disgusted with how people on both sides of the political spectrum are so entrenched in their views and unwilling to listen to the other side. The extremes seem to be winning the war of political discourse. I read this with my church book group, and most in the group seemed to agree with Meacham’s central argument, although some had quibbles. Having just read Marilynne Robinson’s recent essay collection, I was amused to note that Meacham seems to interpret John Winthrop’s “city on a hill” address in exactly the way that Robinson says we should not. (Robinson says it’s not about America shining as a beacon, but about being exposed so others can see our mistakes. I think she’s right. ) Meacham also sees more positive value in public religion than I do. As a Christian, I believe that people of all faiths (and of no faith) have a right to speak out and even to express religious convictions in public, but I’m not comfortable with state-sponsored prayer, even non-sectarian ones. The message it sends is too confusing. Overall, this is a pretty good read about the role of religion in America. It covers a lot of ground, which is both a weakness and a strength. There’s lots of information, but not necessarily a lot of depth. But for those looking for a readable overview on the topic, this is a good book to consider. Sounds like a really interesting book and relevant too given the current poltics in this country and the presidential election. Thanks for writing about the book. I might have to check it out! You don’t need to believe in God or any other deity, or go to church, to be a good Christian. In fact many people who are vociferous ‘bible bashers’, are the most unChristian people I have come across. I totally agree that a lot of people who claim to be Christian act terribly, and many people who never have been to church and don’t believe in God are wonderful people. I do think that being Christian by definition means believing in God and Jesus Christ, but people who don’t believe in God can definitely act in a Christlike way, more so than some Christians do. This is one of my major beefs with our current political situation, but one that, as you point out, is fraught with problems. There is no way to accurately sever religion from politics. However, it’s rare that I come across a regular church attendee such as yourself who actually is open to the idea that other religions do and should/can exist in America. I teach American literature (in fact, it’s my favorite course to teach), so seeing these intersections and these attempts to be this “city on a hill” are really fascinating to me. 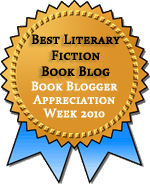 Have you read Sarah Vowell’s The Wordy Shipmates? It does a really in-depth analysis at the ways and times in which the “city on a hill” metaphor is and has been used. Great post. I don’t read a lot of nonfiction, but this sounds like one I’d enjoy. There are a lot of church goers who do respect others’ religious beliefs, but, alas, they don’t get–or seek–much attention from the media. It’s sad, really. I have a long-standing interest in this area, but have not read this book. I’m glad to read your review and have ordered it from the library. This is one that my son and myself will be interested to read. As he is nearing his graduation from a private, Christian high school in a few days time, we have had some interesting discussions about the subject matter that this book covers. He had a teacher in his American Gov’t course who seemed to be pushing the whole idea of God and State and as we have seen in countries around the world, as well as our own, this does not always make for the best situation. Thanks for calling my attention to this book. You’re welcome! I hope you and your son find it helpful. I thought Meacham did a nice job cutting through some of the misconceptions about the founders’ beliefs.